Onyx is a Silver to Gray eye liner. It has very tiny amount of light refracting qualities. Another great color! I bought the starter kit about 6 months ago and have been hooked ever since. Every once in a while I get caught up in make-up ads that promise all these wonderful things and I will buy it (go off my mineral hygienics)and be disappointed. I have very oily skin, so finding something that doesn't grease out or get patchy and in my laugh lines by the end of the day is hard. I do wish it would last longer during the day,because I don't like reapplying, but I got the finishing powder this time, so hopefuly that will help. I suggest anyone who is tired of testing out every foundation on the market, to try this. I works well with any kind of facial lotions, under eye creams and facial serums your using. 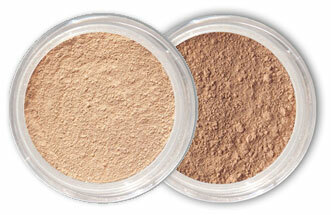 I also blend some of the sun kissed bronzer with the foundation during the summer months to add more color all over. Hi, My name is Sara and I am from India. I wanted to let you know that I'm very happy with Mineral Hygienics. I ordered the Medium Start-up Kit and am very much satisfied. I also ordered a lipstick in the color, Mystic. It's awesome and I am so happy that I finally got a lead free lipstick which would protect my lips. I have been a long-time fan of mineral powder foundations and makeup. I hate the way liquid foundation feels, so when this kind of makeup came on the scene, I was one happy Diva. I've tried some great products, and some not-so-great products, but was recently introduced to a new line that has instantly become my absolute FAVORITE new brand: Mineral Hygienics. This stuff is like BUTTAH. Seriously. It goes on so smooth and silky and gives me the nicest, most natural looking color. I got their starter kit along with their Cool Kiss Mineral Bronzer and Glow Mineral Illuminizer. For a fair-skinned Irish gal like myself, I was duly impressed that the makeup gave me a nice, subtle glow. I looked natural - not orange-y. And the best part? I didn't need to re-apply all day. The coverage was great all day long. No shine, just a nice, even complexion. I think the reason that I like these products so much is the texture, though. It's really, really smooth and silky and super-easy to apply without looking like a cake-y mess. It was my first experience buying online, first with mineral make, up and first time ever with full make up. I made a lot of mistakes on my order. I must have been a customer service nightmare, Jenny (customer service of Mineral Hygienics) has been nothing but simply THE VERY VERY BEST! She patiently helped me assess my need, help me match colors, help me monitor the airmail from Malaysia, and helps coordinate the exchange. GREAT WORK Mineral Hygienics!! Continue to have this High Standard! I have been using another brand of mineral make-up which I loved until I did some research on the effects of bismuth. After much research, I ordered a Mineral Hygienics Starter Kit (very impressed with the idea of the money-back guarantee). I didn't think I'd find a mineral make-up I'd be as happy with as my previous brand but thought that it would be a worthwhile sacrifice not to be using bismuth. Mineral Hygienics has surpassed my expectations well and truly! The color is perfect, the cover is as full as I like it to be and it has a lovely matte yet radiant finish. It stays on all day and I do not look really shiny after a few hours like I did with my old make-up. Thank you, thank you...I could not be happier! My skin is 28 years old, very fair with pink undertones - which become more than undertones in my nose area and that is what I need covered up, as well as the occasional pimple and other minor imperfections. I am tired of fluid foundations (MAC, Clinique, Chanel etc. ), as they tend to stay a little too fluid on my skin, and wont saturate unless I use plenty of powder, making me look very made up. Smashbox Halo mineral foundation, their lightest color is too dark, and it gathers around my nostrils, and leaves my nose otherwise not covered and shiny. Bare Minerals which caked on my skin after a few hours, and the foundation colors are too yellow for my fair complexion. looked very "makeupy" even though the colors were great. It also made me break out on my cheeks, which is usually not a problem area for me. Now I have found Mineral Hygienics! It stays where I put it, and I only need to reapply the finishing powder after wearing a mask during some processes at work. I use Bare Minerals Bisque as a concealer on top of my foundation still, as it works well, but when it is empty I will buy Mineral Hygienics! I have searched for makeup that looks like I am wearing nothing, this is the only one that fits the bill! I order it from Australia, and it comes usually within the week. It is light and non greasy and stays on even after the gym. I highly recommend it! I have always been complimented on the peaches and cream skin I was born with. Well, times are changing. I am now entering my 40s and my fair skin has fought the good fight as well as it can against the pollution, sun and my not so hot bad habits. I had a facial done recently and I was shocked at the extractions and the damage my skin really had. They recommended I use mineral makeup. I searched and reviewed all brands online and decided to go with Mineraly Hygienics. I am so glad I did! I am starting to receive those wonderful compliments again and I love never having to touch up my makeup during the day like I used to before. I also love that I didn't have to spend more money than I was paying before but this time, it's delivered to me. I look forward to trying more of your products! I love this product, I am a licensed cosmetologist and have worked with all kinds of cosmetics. Mineral Hygienics is the best. It stays on all day and is healthy for your skin, I get so many compliments on my skin, this is the only thing I will use for myself and my clients. Onyx is long lasting and will continue to look great all day! This anti-oxidant enriched formula has a soft and creamy texture. It glides on super smooth and the sponge tip makes for easy blending. The water proof formula will not smudge or run, but is easily removed at the end of the day!